Flexi, 9.25 x 12 in. / 328 pgs / 230 color. "How can you not laugh at a sausage smoking a cigarette, or a screw singing Schubert? But that’s not exactly what’s funny about them. What’s funny is how von Wulffen invites the comic into the room with painting, and how the very presence of the comic skews the usual relations between paintings and their context, and vice versa." Edited by Isabel Podeschwa, Bernhart Schwenk, Joe Scotland, Amelie von Wulffen. Text by Manfred Hermes, Bernhart Schwenk, Amy Sillman. A monograph on the German painter Amelie von Wulffen (born 1966) has long been overdue. For more than 20 years, the artist has been developing a formally and stylistically diverse oeuvre (including collages, installations, animated films, drawings, sculptures and paintings) that possesses a remarkable thematic consistency. Amelie von Wulffen: Works 1998–2016 shows the artist returning again and again to the process of coming to terms with the repercussions of German cultural history. These heavy themes are lightened by an acid humor, most obvious in Wulffen’s drawings and comics, which spares no sacred cows. 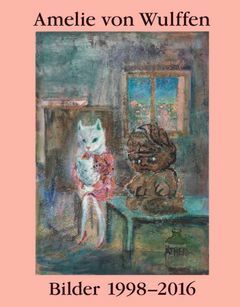 Richly illustrated with texts by Bernhart Schwenk and Amy Sillman, Amelie von Wulffen: Works 1998–2016 presents the painter as a role model for a younger generation of artists. Foreword by Cay Sophie Rabinowitz. Text by Heidi Zuckerman Jacobson. FORMAT: Flexi, 9.25 x 12 in. / 328 pgs / 230 color.